We’ve had a lot of black beans, rice & plantain this trip, believe me. El Plato Typico is certainly cheap, but it had certainly become mundane, if not rather boring, as we ended our days in Nicaragua. However, as soon as we hit Guatemala & ate our first meal, it was like food had been reinvented! Even the three food items above, were transformed with the addition of spices, garlic and a little culinary imagination. So in tribute to Guatemala & the best food so far, here is a special dedicated piece. 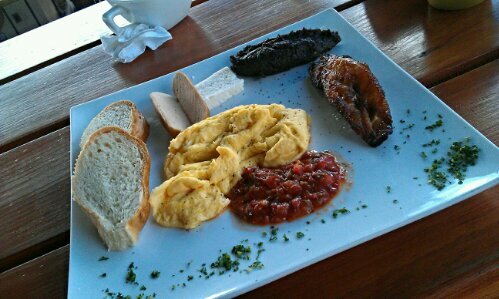 Breakfast is a feast in Guatemala & sets you up for the day. In fact, most days, it meant we only needed 2 meals & we skipped lunch & went for an earlier dinner instead. 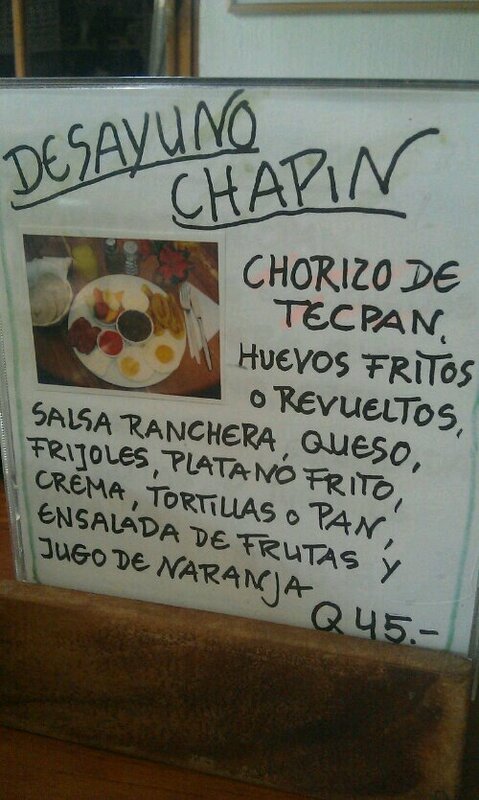 There are a huge variety of breakfast options to choose from: the typico plate is called a Chapin. If you don’t fancy Chapin, or the other traditional breakfasts, there are a range of options including: various omlettes, American pancakes (not one of our favourites) or the Guatemalan favourite: Cornflakes (apparently they love them & are available everywhere). In Antigua, we would strongly recommend Cafe Santa Clara which offers about 15 breakfast options, whilst you are either serenaded by live music or get to watch DVDs of Latin American music favourites. It’s open to 9pm & also offers lunch & dinner. 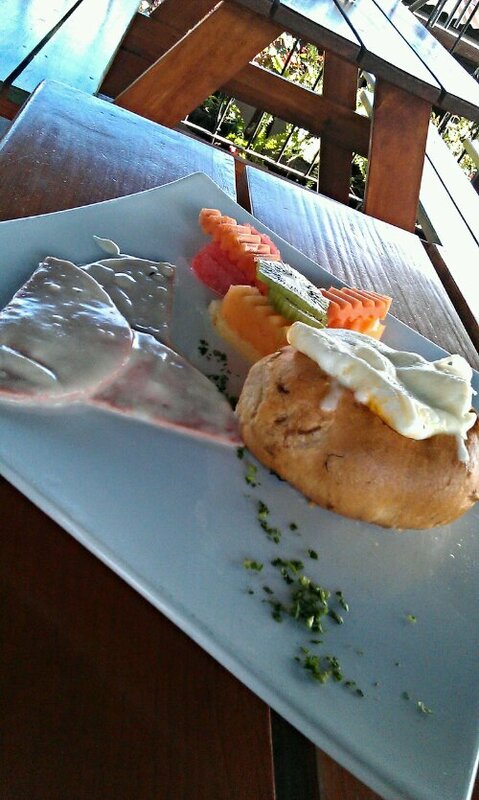 Another favourite at Cafe Santa Clara: Toasted bun with salsa & poached egg, ham & creamy cheese sauce; with a side fruit salad. 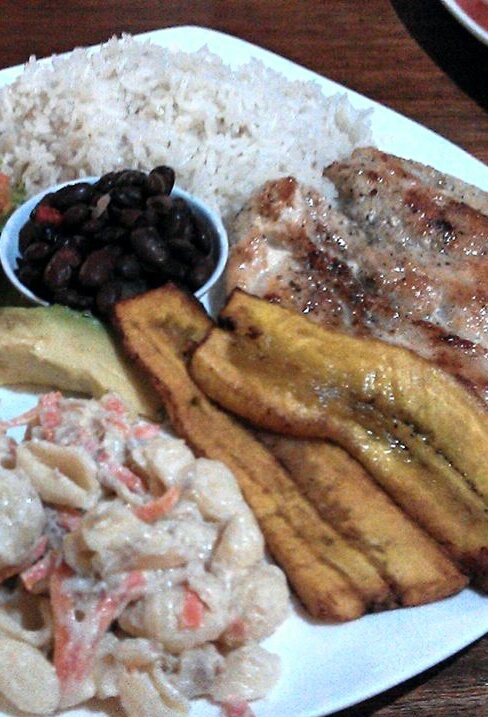 There is a vast selection of International food available in Guatemala. This included some strange fusions such as Mayan/Vietnamese & Japanese Sushi/Guatemalan. Being Guatemala’s neighbour, Mexican food is also widely available. adding still further to the spice & variety of local food. We always prefer to eat local & traditional. Again the selection of amazing flavours, variety of vegetables & pure colour on a plate created a ‘Food Heaven’ after the rest of Central America. Soup: especially chicken. 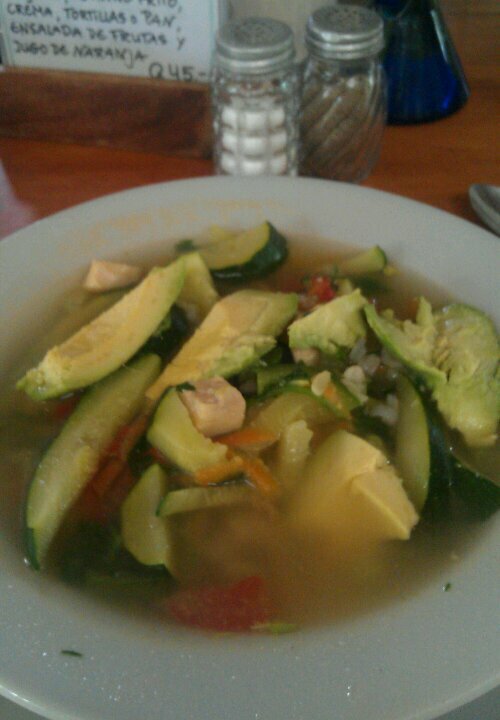 Ok not that different, but there is something special about Guatemalan soups. Mosa – Dark Beer after months of larger this was a treat. 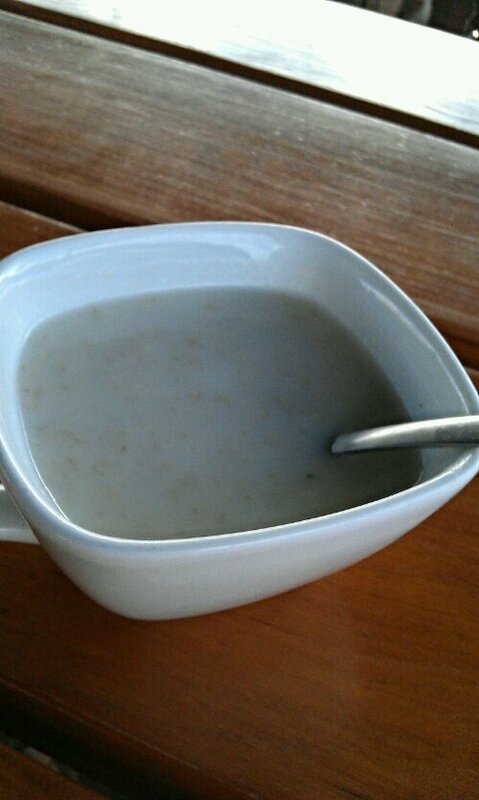 Mosh – this has different names across CA but is a watery oatmeal drink with cinamon. It looks like watery wallpaper paste, but tastes great. Served with breakfast or as a mid-morning treat. Tortillas are available throughout CA but these are smaller & thicker & definitely the most tasty. 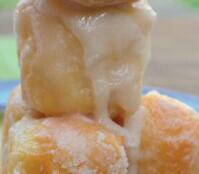 Small balls of dough like doughnuts & covered in sugared icing. Stacked into towers. I’m very hungry now! ;) puts my breakfast to shame….. Certainly is amazing food. I’ll have to be careful I don’t put back on all the weight I lost. Breakfast is certainly my favourite. Are you managing to run much with all your amazing site seeing? Any nice plans for your wedding anniversary?